Bard party at Theatricum Botanicum! William Shakespeare turns 450 this year ! The “official” birthday date is in April but no one really knows the date so you can celebrate the Bard with impunity this weekend at a free b-day bash. For full Bardolatry immersion, check out Ms. Go Go’s weekend cheat sheet to Shakespeare around town . Shakespeare’s 450th Birthday Party at Theatricum Botanicum – Join William Shakespeare and Queen Elizabeth (or reasonable facsimiles) plus jugglers, wandering musicians and madrigal singers for complimentary birthday cake and beverages in a gorgeous Topanga Canyon setting. Shakespeare on the Road will be presenting the venerable troupe with a special plaque. 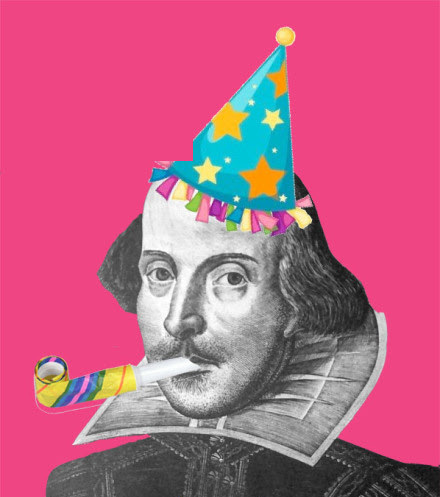 SHAKESPEARE’S 450th BIRTHDAY PARTY — Sat, July 26 FREE party @ 1:30. Plays at 4pm & 8pm: $15 – $37 — Will Geer’s Theatricum Botanicum, 1419 N Topanga Canyon Blvd, Topanga 90290 (midway between Pacific Coast Highway and the Ventura Freeway) 310.455.3723. More info & tix HERE. Free Shakespeare Festival in Griffith Park — The Griffith Park Free Shakespeare Festival kicks off tonight with imaginative productions of Twelfth Night and The Taming of the Shrew by the Independent Shakespeare Company whose mission is to make Shakespeare’s plays accessible for a modern audience. Get to the park early for pre-show performances by Invertigo Dance Company on Saturday and Sunday. TWELFTH NIGHT & THE TAMING OF THE SHREW — Fri, July 26 – Aug 31. Pre-show @6:30pm; Plays @ 7pm. FREE — The Old Zoo, Griffith Park. For driving directions go HERE. For a complete schedule, go HERE. Midsummer Night’s Dream at ZJU Theater — Director Denise Devin has a deft touch with Shakespeare and the award-winning ZJU Theater Group always puts on a great show with innovative costumes in their intimate black-box theater. It’s not summer without Midsummer Night’s Dream…so go. 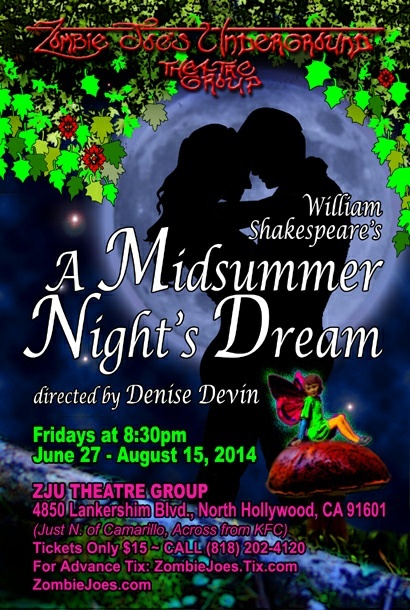 MIDSUMMER NIGHT’S DREAM — Fridays @ 8:30pm through August 15. $15 Reservations: 818.202.4120. For more info & tix go HERE. Shakespeare by the Sea’s Hamlet– Want some brine with your Bard? Head to Hesse Park in Rancho Palos Verdes on Sunday for Shakespeare by the Sea’s FREE performance of Hamlet. You’ll get shivers from the play, the views from Catalina Island to Malibu, and the marine layer so bring a wrap as well as your picnic! HAMLET — Sun, July 27 @ 7pm. FREE — Hesse Park, 29301 Hawthorne Boulevard, Rancho Palos Verdes 90275. For more Shakespeare by the Sea dates/locations, go HERE.